I decided to start quilting on a total whim. I think I was just wandering around a used book store and stumbled across a quilting book and thought, "I bet I could do that." So I picked up a book (based solely on the title because it had so many superfluous exclamation points and made me giggle: Quilts! Quilts!! Quilts!!! : The Complete Guide to Quilt Making by Diana McClun) and read it cover to cover that night. My mom had bought me a sewing machine for my birthday, so I was set on that front. Soon I had settled on a simple rail fence quilt, bought my cheap supplies from Joann, and off I went! I think you can see my progression pretty clearly in the photo above! I didn't actually finish my first quilt right away. I worked on it for a couple of months here and there and started getting a little frustrated. My seam allowances were horribly inconsistent and it was making putting the quilt top together a real pain. So I shelved it for a while. Over a year, actually, during which time I started and almost finished my Master's degree (I don't know when I would have had time to sew, anyway!). Then I started reading quilting blogs while removing staples at work (being a student worker in an archives is seriously boring). When I started my first quilt, I had no idea how huge and amazing the online quilting community was and I definitely had no idea what "modern" quilting was. It was a total revelation and suddenly I decided I HAD to finish that first quilt. So I did. I let my annoyance at all the imperfections go and just decided to look at it as a learning experience. Then I decided to start a blog. Why? Mostly to keep track of my obsession and, of course, because all the modern quilt blogs I had been reading were written by such wonderful, friendly people. I knew this was a community I wanted to be a part of. Once that first quilt was finished, I immediately started the Christmas quilt above, which was a gift for my boyfriend's parents, who are awesome. And since then, the obsession has just grown! I have completed just the five quilts you see above, but I have also made a number of smaller sewing projects. See labels in the sidebar for more info! This is just a sampling- there are several labels in the sidebar you can click to see more! What else do you do besides quilting? Other than quilting, I am also learning to make clothes (slowly but surely- these projects usually take a backseat to quilting). I spend a lot of time with yarn and hooks/needles (see below). I learned to crochet long before I got into quilting. 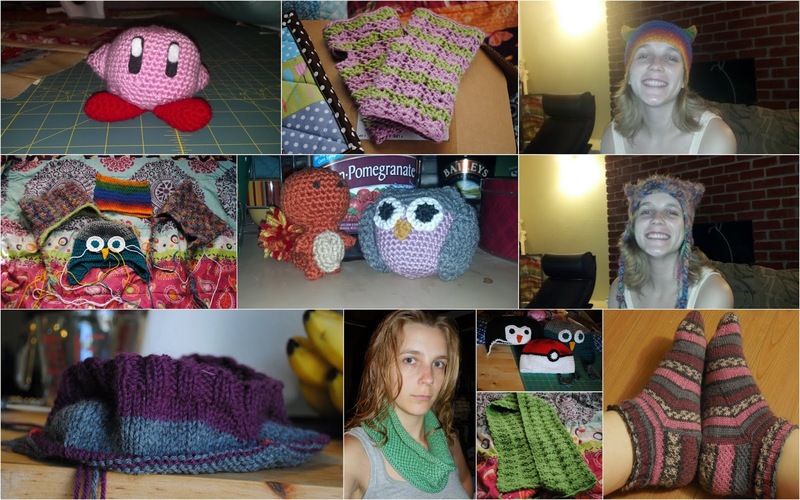 Lately I have been knitting more than crocheting because it is a new skill I picked up, but I still love both! I hate having idle hands while watching TV, so it's great to have some yarn projects to work on. When I'm not crafting, I am generally reading, baking, or spending time with my two dogs and boyfriend. Or you know, working. There was a period of a few months after I graduated in December 2012 with my Master's degree in Library Science that I was only working 10 hours a week, which left tons of time for crafting. I loved that, but I love being able to pay rent more :P Now I'm working in a library (I know! That's what my degree is in! AMAZING!) and really enjoying my first big-girl job. It was a struggle finding the balance between work and hobbies, but I think I've got it down now. I currently have three ongoing quilt projects: my Elephant Swoon, my scrappy stitch and flip quilt, and a pinwheel quilt (that I haven't touched in over a month). I have news on the first two, though! I have finished my first swoon block and I absolutely LOVE IT. Look at all the elephants! LOOOOVE! I may notice my Swoon block has a few extra seams... That's because I had to piece together a few of the bits in order to have enough yellow fabric. But I think it looks okay. This is the only block I'll have to do that for, so it should be no big deal. I also finished all my blocks for stitch and flip quilt! I didn't snap a picture because I've shown you so many pictures of stacks of those blocks already, but soon I should have some new progress to show you! YAY! Well, I hope you found something interesting in that long winded post! This blog hop has been so much fun so far and I have gotten to know so many new people. I really appreciate Beth putting it all together for us- you should go give her some love! It is very nice to meet you. I love all your projects. Your swoon makes me swoon. lol I am a new follower. Oh my god Anna, I saw your block and almost passed out from sheer awe and jealousy!! I can't even tell you how stunning that quilt block is, so I sure hope you believe me. I want to make one for myself now more than ever! Anna, your block looks incredible! Gah Allison and I are swooning for your swoon, hahaha. I really need to get on that, but I have to move out of my apartment first. But for real, you're incredibly talented and I love just watching you create beautiful things in blog land. You rock! Hi Anna! Great to read more about you. You have some great projects! Looking forward to seeing more of your Swoon. Are you going to incorporate more elephants into the other blocks? Oh and congrats on your new job! My dad was a librarian... though I imagine the skills you need these days are much different from those he had. By the way do you know word verification is on? You are so super creative! I loooove your brown/grey/pink socks - they look so cozy and cute. I wish I could knit/crochet!!!! Your elephant swoon looks awesome - such fun fabric and colour! Great post, Anna! I have really enjoyed getting to know you through the hop this summer. And hearing about your 'big girl job'.... Happy for you! Loved reading about your first quilt and seeing everything you have made since. I especially like the houndstooth quilt and those pillows! Your scrappy trip is amazing! I really want to make one. Great blog hop post and introduction to your quilts. The name of the book made me chuckle. Absolutely love your swoon blocks. They look great. The scrappy trip quilt looks great too. I absolutely love your scrappy trip along quilt. It turned out beautiful. I really need to make myself one of those! That purple houndstooth looks rather familiar ;) And love your take on the scrappy trip! Your post was very enjoyable to read and I quite love your elephant Swoon block! The crochet critters are also great. Nice meeting you on the Hop! 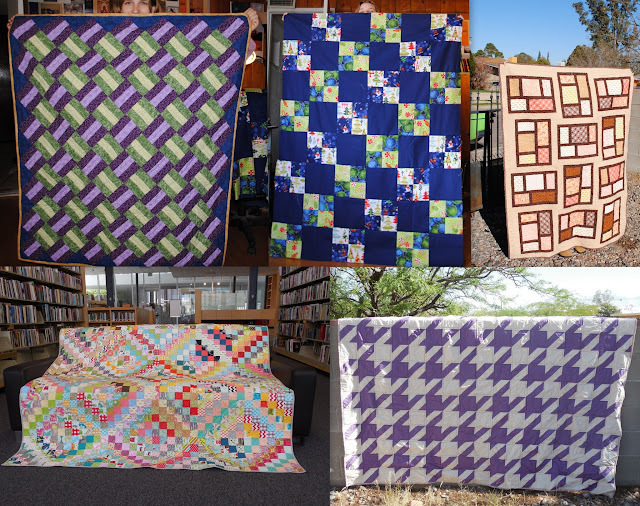 Great post - and you're right, you can definitely see a progression in your quilts. I think one of my favourite things about blogging is keeping a record of all those quilts and other projects, and being able to look back on what you've done. Your elephant swoon is going to be amazing! so nice to "meet" you via the hop! and may i just say, your hats are hilariously awesome!!! Love the swoon block! Just got the fabric for mine. It has been wonderful getting to know your story and enjoy your blog!! I love you beeing so Young and making all These beauties. I sewed clothes in your Age and had a Long break of sewing. Go on, love it! Hi from a blog hopper! Your sunny elephant swoon is so great! nice to meet you via the blog hop! Looks like you have lots of finishes in the relatively short time you've been quilting! Nice to meet you on the Blog Hop! Your projects look really great. I love your scrappy trip and your houndstooth quilt. Just awesome! I had fun reading through your blog, so many great things going on. Your finishes are lovely. Looking forward to seeing the elephant swoon quilt finished. You did a great job with your post! I love the Elephant Swoon block. I have this pattern, but haven't started any blocks yet. Still mulling over my fabric choices, I think. Your stitch and flip blocks are wonderful. I seriously love how they lend themselves so well to any number of block layouts, just like HST. I'm not a big swoon fan, but your swoon block is awesome! 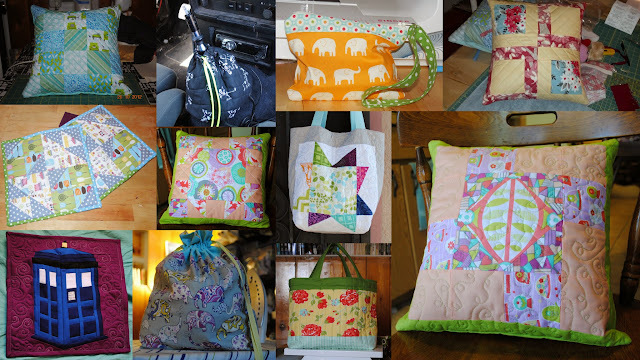 I love the whimsy by using the elephant fabric. Can't wait to see that quilt finished! By the way, I am digging your new layout! How did you get those little buttons at the top right? Also, bought my fabric for two swoon quilts today. I'm ready. I love the elephant idea! What a great block. This quilt will be amazing! What a wonderful post! I love your elephant swoon block (it's massive!) and can't wait to see more! Such a cute swoon! Love that elephant fabric too!! Nice to meet you on the bloghop! I love your elephant swoon block! And your mini-quilt with the Tardis is great!! What field did you do your master's in? Based on my experiences in archives, I can imagine there are both really interesting and reallllly slow parts. :) It's nice to meet you through the blog hop! Coming via the Blop Hop. That may be my favorite houndstooth quilt! I love the purple. And you better watch your back because I'm about to steal your scrappy trip quilt! I love to see your progression, awesome. And your elephant swoon is going to be so pretty, can't wait to see more:) what a fun day job too!! Nice to meet you! I convinced myself early in my quilting adventure that all the little imperfections that might drive me crazy would just add to the handmade authenticity! Anyway, that's my story and I'm sticking with it! Love the idea of the elephant Swoon. There are so many great elephant prints out there... too much fun. Aren't those swoon blocks fun?! I love the sunny yellow you used. Anna, how did I not know you were a librarian?! So cool. (My dream career, which I've always chickened out of.) I still love your scrappy TAL quilt, something about the combo of colors you chose just makes that pattern sing. I am watching for sweater progress! Us new knitters have got to stick together. I love, love, love your houndstooth quilt. Sorry I'm a little behind at checking on blogs. I really like all of your pictures and can't wait to see more of what you're up to. Thanks! So nice to get to know you through the hop! Beautiful projects Anna :) I look forward to more--especially the swoon. Greetings fellow librarian! Where did you get your MLS? I love that Kirby Amigurumi, so cute. Also, it's awesome to see your quilt progression. I can't wait to see that swoon quilt finished! It was nice to meet you Anna! You have made quite a few lovely things! I'd really like to try my hand at knitting one day. Haha I haven't seen a swoon quilt quite like this one, and it's very fun to see some humor in it! Elephants on Parade it could be called. Nice to meet you from the LGA blog hop, sparkle on!